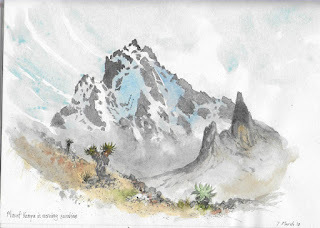 This entry was posted in Adventures with wildlife, David Bellamy, mountains in watercolor, Sketching exotic plants, sketching outdoors, Watercolor mountains landscapes and tagged sketching, Watercolour techniques, Watercolour washes by David Bellamy. Bookmark the permalink. What a wonderful experience but I do hope you are feeling better. Fascinating, I love your adventures David. What an experience and so lucky to sketch in such an environment. And yes, hope you’re well recovered ! I hope the LIKE button shows up as ut did not look as though it would. Must be an amazing place to see. I am way too old but like wildlife. Looking forward to more about your exciting trip. Lots, myself included, have suffered those same winter health travails. You are not alone. It is touring gere are niw across the bug pond in US and Canada. What an amazing experience but hard with your health problems. Do take care of yourself otherwise there won’t be any expeditions. Do hope you are fully recovered now. Talk about suffering for your art! Having been housebound all winter myself the urge to get out is overwhelming but for now I will have to be satisfied with seeing all the spring flowers coming up in the garden and be an armchair traveller. I personally do think that the best paintings are done on the spot or from preliminary work done on the spot. Well done to you, your spirit of adventure is remarkable as is your superb artwork. Best wishes. I hope you are preparing another book of these adventures! This is much too short an appetizer! I do share your passion for outdoor, wildlife, climbing mountains – and sliding down them -, but no longer have the guts to go it alone or go it at all, beyond our local hills… So you are right to push the boat while you can. I enjoyed your paintings and Jenny’s pastels at Patchings today. Impatient for the Festival to come along. Well done David, an inspiration to us all , so congratulations all round. Must have been a wonderful climb though. Hope you are recovering well by now. Hope you are feeling better, David! I think you are so brave and adventurous to climb when you are sick with chest ailments. Thank God you are Ok! Overall, I think you achieved your goals. I’m so inspired by your determination to paint even in the most challenging circumstances. Looking forward to seeing you at Patchings again. Take care and stay well. Your paintings website is among the best things I have ever found on my laptop. Great David. Moral, get as much done as you possibly can while you are still fit enough. It’s surprising how quickly health restrictions can catch up with you. Think Nigel!!! Your episode with breakfast and the monkey reminds me of a time in the rift valley when with about ten people eating lunch at a large table, a very large male baboon came an up-ended the table. The whole troop then descended on the spoils left on the ground. You don’t argue with something with teeth that large. On another occasion, I left Bev in our hut reading while I went to visit another part of the camp. Unfortunately, I left the door open. Bev thought she heard me come back and thought no more about it until she realised that there was a very large baboon sitting at the table beside her quietly removing all the sugar sachets from the tea making facility…..Never a dull moment. So keep travelling while you can and enjoy every moment, and we all look forward to see more of your travels in described paintings.